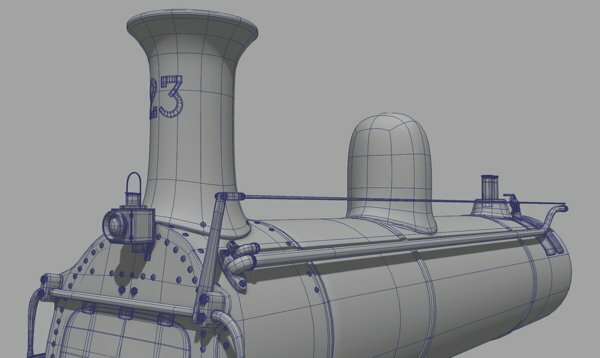 A locomotive modelling tutorial for 3D Artist. The tutorial was created in 2014. 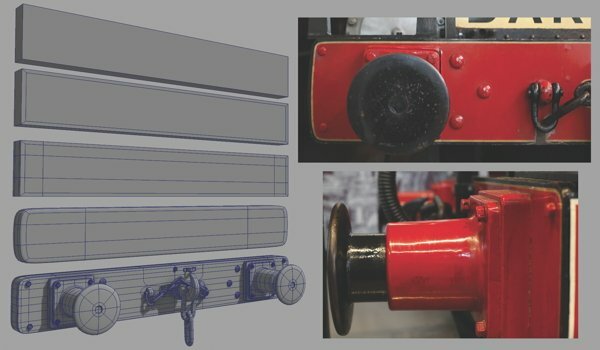 The first thing you want to do is bring in a reference sketch to help set up the general proportions of the locomotive. In the viewport menu for the Side view, go to View>Image Plane>Import Image. When the Open screen pops up, select ‘trainRef_side.jpg’. With the image plane selected, go to the Attribute Editor and use the Center attributes to position the image so the wheels sit on the ground plane and translate the image in the X-axis so we have space to work on the grid. I’m using Maya 2012, but If you are using 2013 or above, you should be able to use the Translate tool to move the position of the image plane. 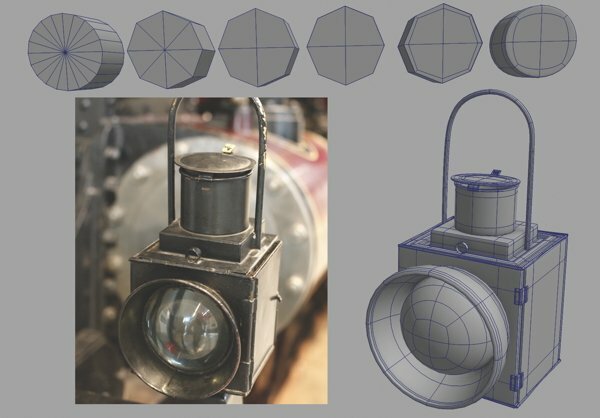 Next, use basic shapes to block out the major shapes, making sure to check how they come together from all angles. I’ve used a combination of cylinders and cubes to block out the model. Once you’re happy with the blocking, pop all the geometry into a layer and name that layer ‘block_geo’. Next start to refine the area at the front of the locomotive: the buffer and the coupler. Starting with a basic cube, begin to create the main area to which the buffer will attach. Select the front and back face and go Edit Mesh>Extrude. Use the manipulator to scale the faces inwards and then use the Insert Edge Loop tool to create a nice tight edge that runs around the cube. Adding further edge loops, refine the mesh while making sure to always refer back to the reference images. It’s worth examining how the light falls on the locomotive, trying and replicate that within the model. 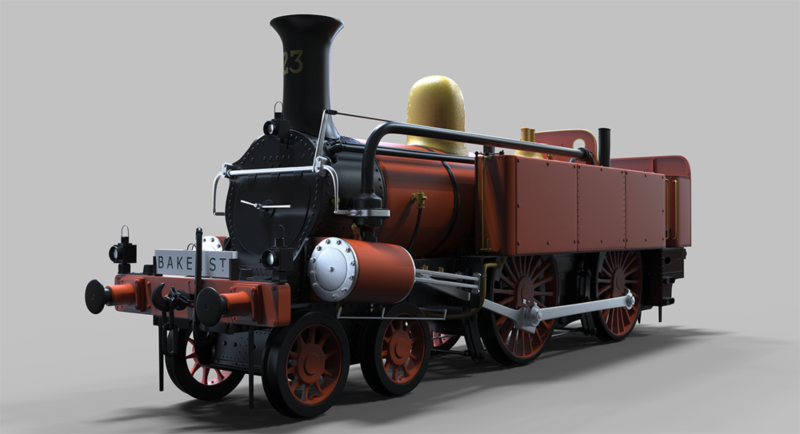 Next you can work on adding the coupler and chain links using simple torus primitives to give the front its distinct character. For the headlight, first break down the reference, noticing how the headlight is made up of many individual plates held together by links. With simple cubes, use the Bevel tool with the Segments set to 2 so you can stick to quads. By duplicating this object many times, you can create all the sides of the headlight. Next, create a cylinder, setting the Subdivision Axis to 8 in the Channel Box to keep the mesh light. On the top and bottom of the cylinder, select every other edge and delete them to give me all quads again. Follow this by adding two edge loops running around the cylinder, one at the top and one at the bottom along the height. This is the manner in which we’ll create all cylindrical objects for this model. With the edited cylinder, wrap them around the headlight to match the reference. Continue to build up the remaining parts of the headlight by taking the basic primitives and refining. Continue to work on the front of the train by adding the sign, the metal framing and the smoke box door. Again, all these elements can start from the humble cylinder and cube, then refined to match the reference, making sure to pay careful attention to the uniqueness of each part. To add bolts, make spheres, reduce the subdivisions and then flatten them slightly using the Scale tool. These have been positioned throughout the entire locomotive and for the majority of them we can place them slightly out of alignment to present a more authentic aesthetic. Next I move on to create the boiler, the chimney, the steam dome and the steam powered whistles. 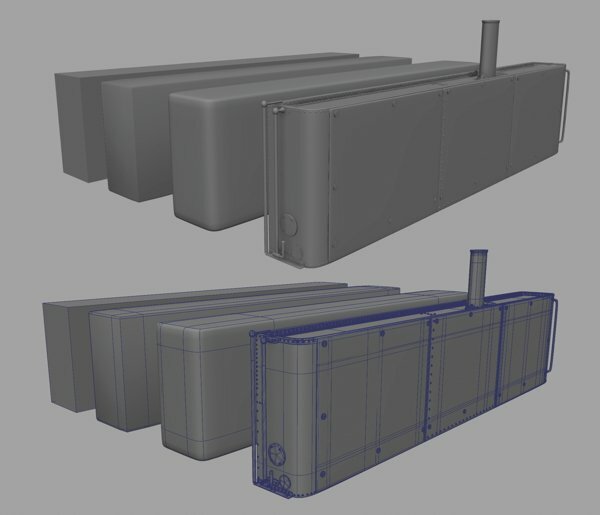 Refined cylinders will do the job for the boiler itself with the front slightly angled to match the angle of the front plate that sits on the front of the boiler. Instead of having the chimney look as if it is penetrating the boiler by simply sitting it through the mesh, I translate the vertices of the chimney to sit just above the geometry. I then create a tight edge around the chimney at the base to create an illusion of thickness. I also create a tight edge at the top of the chimney so we can get a nice rim light affecting the mesh. To finish off the chimney, I have also added the 23 sign. For the steam dome and the steam powered whistles that sit on top of the boiler, I follow a similar procedure. Once we have the boiler in place, we can add the water tanks (cisterns) that sit on either side. Starting with a cube, beveling the edges should give you enough geometry to hold the form when the mesh is smoothed and also emable you to round out the two outside edges. Here you can add extra metal bars that sit on the inside and the many bolts that run along them. Instead of working them from new, try duplicating and repurposing some of the objects from the front of the train. There are also three plates that are bolted onto the side of the water tank, which can be included to, again, stay faithful to the source material. The bottom of the cistern will also need to be manipulated to make room for the wheels. You should be able to repeat the same procedure for the tender at the back of the locomotive. Connected to the cisterns are metal plates that lead to the pistons situated at the front on either side of the boiler. This region will need to be considered carefully as we will need this to work mechanically when we come to creating the rig. 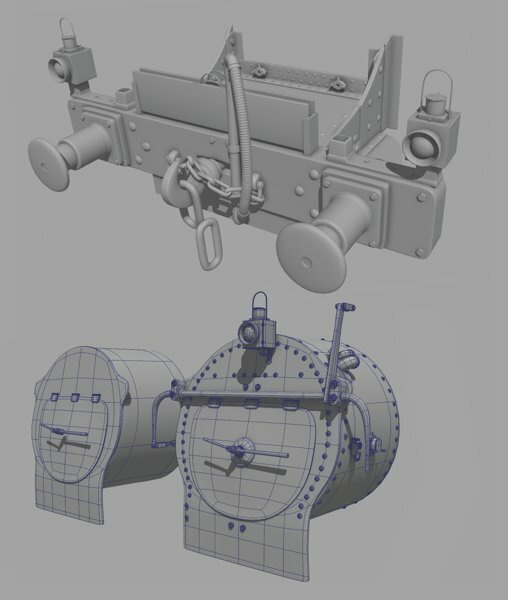 The reference indicates that the pistons are at a slight angle, with the crankshaft stretching from the piston all the way to the first of the larger wheels through an opening on the metal plate that is connected to the cistern. 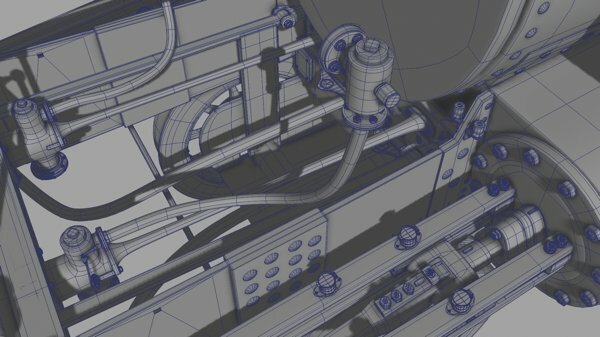 You can then start to add the steel pipes that run from the back of the cistern into the top of the piston and then build the metal work that runs along the front of the locomotive, connecting the two pistons together. Finally, to connect the two large wheels together, add a coupling rod. The leading truck and driving wheels can produced with much the same method and are composed of two parts of geometry; one for the inner and one for the outer portion. The outer portion begins as a cylinder, rotated into position and scaled to match the reference image. Select all the faces at the top and bottom of the cylinder, use the Extrude tool and scale inwards to match the thickness of the outer portion of the wheel. Now grab the faces in the centre and delete them. Select the inner edge loop on one side and extrude towards its opposite side. Use the Merge Vertex Tool to seal the geometry and we now have a hollowed out cylinder on to which we can sit the inner portion of the wheel. Duplicate this now and scale it in slightly to be part of the inner portion of the wheel. Back to the outside portion, on the inner side, add some edge loops, then select a ring of faces and extrude out slightly so the wheel can sit on a track. For the inner portion, create a cylinder and scale it to match the center shape. Next, run two edge loops around the cylinder, close to the rim. Select all the faces that lie in-between around the object and go Edit Mesh and disable Keep Faces together. Then use the Extrude tool and pull out the faces along the Z-axis. Combine the portion that we duplicated earlier with the inner portion and then weld the two parts together using the Merge Vertex Tool. Make sure to continue to add edge loops to make the wheels look less rubbery. Although the majority of the underside would be covered with nuts and bolts, it’s still wise to add as much detail as you can. For this region, however, you can reuse many elements that had already been created. This includes taking the geometry from the front of the train and combining it with some of the metal work of the piston and the coupling rod. Once all the major shapes are in place, I found it necessary to add plenty of nuts and bolts to really finish it off. But, and I think this is a pretty important but, I have not just randomly placed them here, there and everywhere. I’m again, trying to think about the make-up of the locomotive and how these many, many parts are held together. For example, the metal plates on the cistern will need to be bolted on, the inner portion of the wheels is bolted to the outer portion and so on. Every piece of the train will need to be considered so do this as a final sign-off to heighten the level of believability for the asset. Happy modelling.